Now you are really going to think I have lost my mind! 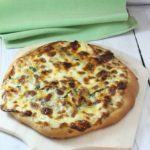 Bear with me, I promise, you will love this Tuna Pizza with Lemon Dill Aioli! This pizza tastes amazingly like a Grilled Tuna and Cheese Sandwich! It is cheesy, it has aioli and tuna. How could it not? How could it not be good, I mean, it does consist of pizza dough, too! This month we wanted to come up a different use for use tuna. That, we certainly accomplished! My husband actually thought of the idea. I turned up my nose when he first suggested it, but the more I thought about it, the thought grew on me. I knew I didn’t want to use a marinara, so came up with this aioli. It is super easy because of a new yeast that I found a month or so ago. It’s Fleischmann’s Pizza Crust Yeast. I just mixed it up in my trusty Kichen Aid Mixer with the dough hook attachment. The dough was perfect! There is less spring back than you will get from traditional bread yeast, so it lays out however thin you might like it! I even cheated on the aioli and used store bought mayonnaise, just added some fresh dill and the juice of half of a lemon. Therefore that took about 2 minutes. So by the time the Kitchen aid had kneaded the yeast, I was ready to put the pizza together. This pizza is so good! Keep an open mind and give this Tuna Pizza try! This pizza tastes like a tuna melt on steroids! Link for homemade pizza dough is below this recipe. Roll out homemade dough to about 12" round. Par bake dough, on pizza stone, if you have them or sheet pan about 10 minutes, at 450°F. Top par baked dough with aioli. Sprinkle tuna on top of aioli. Top tuna with spinach and both cheeses. Bake for another 15 minutes, until desired brownness on top. Here is the link for homemade pizza dough. Interesting combination….I am glad there is no pineapple ! Now pineapple really does sound gross! Haha Laura! Wow! Tuna and pizza…what a combination! Looks so good. I know, kind of crazy but it was so good! Thanks, Brandi! I am craving for a pizza now! this looks so delicious! It’s hard to resist pizza, isn’t it Prasanna? Thanks your your comment! This looks so good! I’ve never had tuna on pizza before but these flavors seem great together. As I indicated, neither had I but it really worked out great! Thanks Ashley! Hot grilled tuna w/swiss comes to mind (tuna melt). Looking forward to making. Yes, you’re totally correct, Platter Talk! It would be great with Swiss or gruyere! Oh wow! I love that topping with the cheese. Never thought to add tuna to pizza. It looks incredible! Like I said, I thought it was a crazy idea that just might work! It totally does! Tastes just like grilled tuna and cheese! Thanks, Tara! I’ve just started to really enjoy tuna on pizza and this recipe sounds so yummy!! Thanks Emily, I never thought it would be as good as it is! What a unique recipe! I saw the name of the recipe and was unsure myself but when I looked the pictures and read the process, I’m feeling a different kind of way! It sounds like it’s delicious! I think I have to try this! That’s a great flavour pairing, This pizza looks wonderfully cheesy too. Is it? That’s interesting! I thought it was a crazy idea but certainly proved myself wrong! Thanks for your comment, Julia! It doesn’t really sound weird to me but I love creating different unusual pizza combinations. I think this looks and sounds great. I love trying new and different pizza combinations, too! They are so much more versatile than pepperoni and cheese!! you literally transformed canned tuna into something decadent. with lemon dill aioli OMGGGG. It really was a good use of the canned tuna! I will definitely use this recipe again! Thanks Sarah! It really is surprisingly good! I love all these flavors, so why not on a pizza? Genius! Thank you Sue! I really appreciate your comment! Have a wonderful weekend!